Teach your horses three essential skills to confidently negotiate gates. 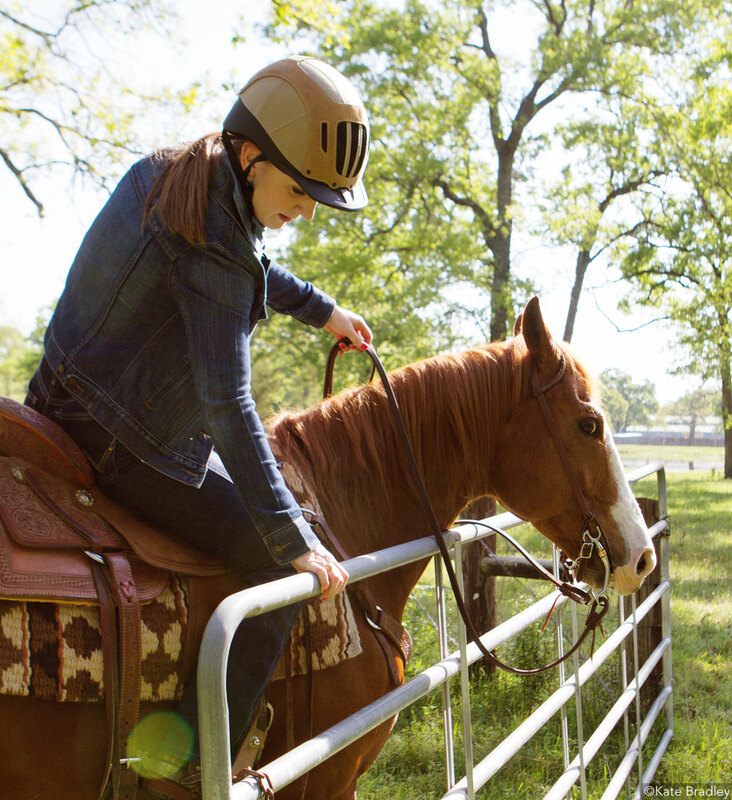 It seems so simple to reach over and unlatch a gate from the saddle—far easier than having to dismount. However, without proper preparation for the task, the gate can become a stressful situation and deter you from venturing down new trails. You need to be aware of the challenges faced when working a gate, including asking your horse to accept a new object and your body weight shifting in an awkward position. 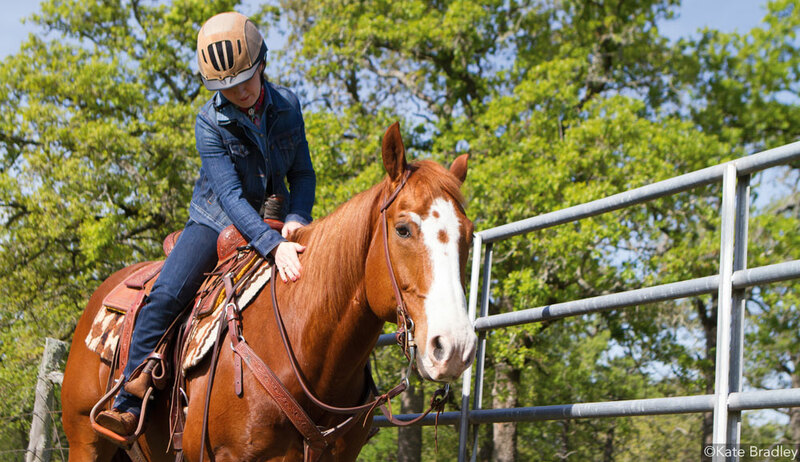 Texas-based trainer Sharon Wellmann has a broad range of clientele, from experienced all-around breed association competitors to young riders just starting their horseback journey. No matter the rider’s expertise, Wellmann focuses on what is best for the horse and rider. If the answer to those questions is “no,” then tackle these challenges. Wellmann says that you need to be able to shift your weight out of proper position without your horse thinking it’s time to move. Goal: Teach your horse that his reaction to a shift in your weight should not be to go forward. Wellmann says to start by standing still in the middle of the arena (not next to a fence), and leaning forward. If your horse walks off, stop and say “whoa.” Continue this until the horse stands when you lean forward, reach down toward your foot, or move your leg on his barrel. Challenge: Teach your horse to wait. Goal: The horse should wait for your cue. First, trot your horse, ask for a stop, and then drop the reins. If your horse walks off, engage rein contact, say “whoa,” and then back several steps while repeating “whoa” before dropping the reins and asking your horse to stand. 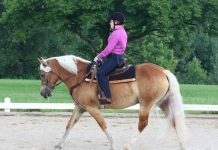 If necessary, increase the steps back each time your horse attempts to walk forward after a stop. “Be sure to back, say ‘whoa’ and release the rein, then back, say ‘whoa’ and release again,” says Wellmann. Take it to the next level by asking your horse to stop, and once he stands, wiggle your body like you are opening a gate. If he moves, correct it in the same manner. Wellmann says it’s important to maintain a calm, soothing tone of voice when you say ‘whoa.’ Don’t scold your horse; focus on teaching him. Challenge: Control the horse’s body parts. When it comes time to open a gate, even one step sideways, forward or back can change your position and angle to the gate. You must be able to control the parts of your horse’s body to open, move through and close a gate. It’s important to be able to sidepass, but also to shift his hip or shoulder closer or farther from the gate, depending on how you need to move the horse so you can reach the gate. Goal: Before riding out, be able to move your horse laterally and move his shoulder or hip independently. Wellmann starts riders off by leg-yielding off of and on to the rail. Begin away from the fence at a walk, then leg-yield toward the rail. The straight line and visual barrier of the rail can help you keep your horse’s body parallel as you work on leg-yielding. You want the shoulders, ribcage and hip moving together as a unit. Wellmann says that the ability to shift your horse’s shoulders or hip independently can help when the gate is at an awkward angle, such as up- or downhill. The ultimate goal is to be able to open and close a gate safely while on the trail, whether riding alone or with a partner. If you’re taking a horse out for the first time, Wellmann suggests riding with a trail buddy that’s experienced with gates. Also, communicate with the other rider about the level of experience your horse has with gates or other trail obstacles. 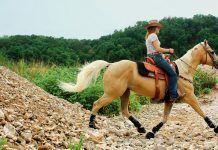 There is no time limit on a leisurely trail ride, so allow your horse the time he needs to be comfortable with the gate. And remember, always reward him for meeting a new challenge. Once you get the gate in place, stop. Allow your horse to stand and take a breath. The goal is for your horse to be comfortable working a gate, not to view the gate as a stressful maneuver. When working the gate, watch how your position affects your horse’s body. Unconsciously shifting your weight toward the gate may pressure him to turn in to it, allowing a potentially dangerous situation to occur. If this happens, do not give in to the natural inclination to pull on the reins to dislodge the bit. Instead, use the skills challenge from pre-trail ride work and ask your horse to move his shoulders away from the gate. He will naturally lift his head, remedying a dangerous situation. Special thanks to Anna Morrison, Ph.D., for demonstrating these exercises. She and her gelding, Twice the Solano, were named Reserve World Champion Amateur at the AQHA Versatility Ranch Horse World Championship. Have to give these ideas a try. Reading the article I sure hope it is as easy as it sounds. I will have to practice for a bit, I afraid first. Great tips, will give them a try.